WHAT IS FRAXEL DUAL LASER? Fraxel is the best non-ablative fractional laser with Dual wavelengths 1550 and 1927 nm for full face, neck, and chest provided by Albar Center in Edmonton. The non-ablative laser keeps the top layer of the skin (stratum corneum) intact without removing it but can reach the underlying skin layers to stimulate collagen production, rejuvenate the skin and provide skin tightening and pigmentation. 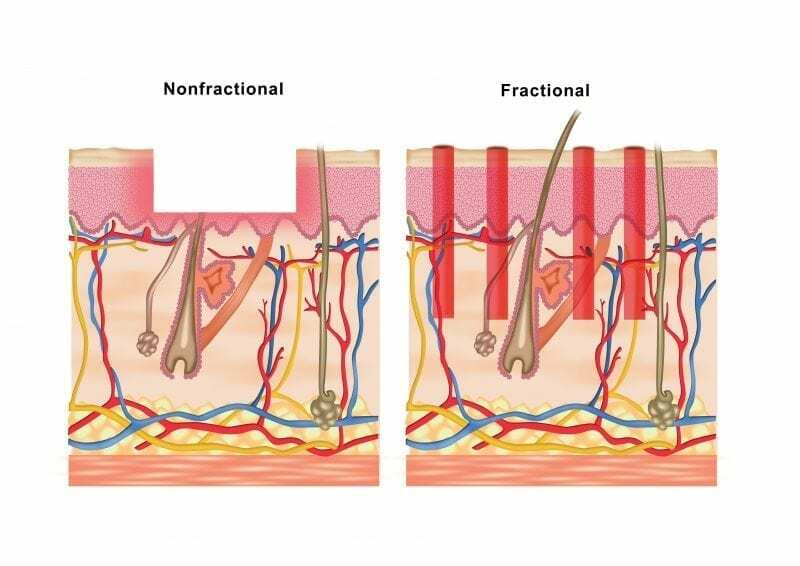 The fractional property is a brilliant addition to the Fraxel technology to minimize skin damage and after treatment downtime. Why the fraxel laser resurfacing machine has two wavelengths? –Improved appearance of acne scars and surgical scar. Fraxel showed better results in treating Melasma and Pigmentation in Caucasian patients when compared with darker skin patients. All the Staff at Albany Cosmetic and Laser Center in Edmonton have extensive training and certified Laser aesthetician. WHAT RESULT SHOULD I EXPECT AFTER THE TREATMENTS? The treatment downtime values between patients to be between 3-7 days. Most of the discomfort is related to the heat, allowing enough time for the Freezing cream to work and the use of the cryo chiller will make the Fraxel treatment more comfortable. The patient might experience some immediate discomfort in the form of swelling, redness and pinpoint bleeding. Acne or Cold sore — It is frequent to see acne and cold sore breaks after Fraxel treatment, Acne usually resolve alone, and it is recommended to take a course of anti-viral Valtrex 1 day before the treatment in highly susceptible patients. WHAT ARE THE ADVANTAGES OF FRAXEL DUAL LASER? Since Fraxel dual combines the fractional and non-ablative properties of Laser, the downtime after the treatment is way shorter than using Ablative and non-fractional Laser such C02. Additionally, both wavelength of Fraxel dual has lower affinity to water than the 10600 nm CO2 laser. This results in fewer side effects such as Post-inflammatory hyperpigmentation PIH. The low melanin absorption of Fraxel laser makes it safe to treat all skin color including African American. 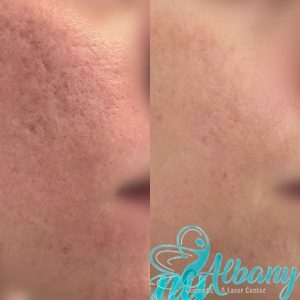 How to Care for Your Skin After Fraxel Treatment? Using 30+ SPF sunscreen is very important to minimize long-term side effect and get the best results from the treatment. Apply the sunscreen 20 minutes before going out. reapply another layer directly before going out. We also recommend using a hat during the first two weeks. Make sure that the moisturizing creams are not too oily or occlusive, most of the good sunblock can also be used for that purpose as well.